This popular article was updated on May 21st 2017 to provide a more comprehensive introduction into an essential, modern tool. Composer is not a package manager. It deals with packages but in a “per project” way. While it provides a global installation option, it does not install anything globally by default. Essentially, Composer allows you to declare and manage every dependency of your PHP projects. Let’s now install Composer so we can see it in action. There are two ways of installing Composer: locally and globally. Because Composer is such a useful and widespread tool, I always recommend installing it globally, as you’ll probably be working on more than one project at once. Note that if you use an environment like Homestead Improved, it’s installed globally by default. If you’re unfamiliar with Vagrant and Homestead, this post will clear things up, and if you’d like to dive deeper, this book will reveal some wild mysteries to you. To install Composer, follow the instructions for your operating system. This moves the composer.phar file to a directory that’s on your path (the location of your filesystem where the OS looks for executable files by default). This way, you can use just the composer command instead of composer.phar. composer help <command> – will show the help page for a given command. 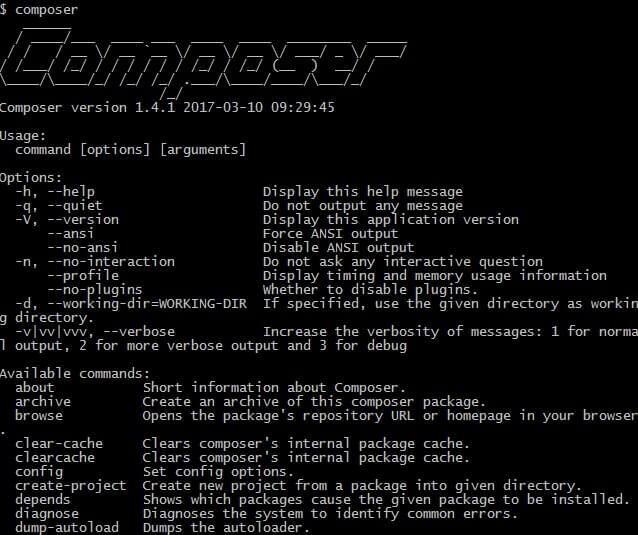 composer self update – Updates composer to the latest available version. composer search – Searches for packages. composer status – Shows a list of dependencies that have been modified locally. If we install something from the source (using the --prefer-source option), we will end up with a clone of that package in the /vendor folder. If we make some changes to that package, the composer status command will show us a git status for those changes. composer diagnose – Diagnoses the system for common errors. This is especially useful for debugging, as it checks for things like connectivity to Packagist, free disk space, and git settings. We will focus our attention on composer init, composer create-project and composer require. To manage dependencies in a project, Composer uses a json file. This file describes all the dependencies, and holds some metadata as well. 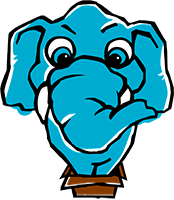 In this example we will create a new PHP project in which we will need PHPUnit for our unit testing. There are several ways to use Composer to manage this dependency. composer init will launch the wizard. The wizard will guide us through the generation of our composer.json file. composer search phpunit will search for all packages available that have the keyword phpunit. After we choose the package we want, we can then use composer require <package>. This command will not only create the composer.json file, it will also download all the dependencies specified. The require key takes objects that map package names (e.g. phpunit/phpunit) to version constraints (e.g. 4.8). Composer uses this information to search for the right set of files in package “repositories” that you register using the repositories key (more info here) or on Packagist, the default package repository which we’ll discuss a little later. If you used composer init or the manual method, you need to run composer install. This will download all the dependencies needed for the packages described in the composer.json file. Note that writing the file manually and then running composer install is the same as running composer require <package>. Using the composer require <package> approach is a recommended best practice. The first time you run the composer install command, the dependencies are downloaded and their installed versions are registered in the composer.lock file. The next time someone runs composer install on the project, it will not get the latest available package versions, but the ones that are registered in the composer.lock file. This way, Composer ensures that your project doesn’t break due to unexpected code changes in newer versions of the packages. The composer.lock file ensures that everyone in the project uses the same version of the packages by not allowing newer versions to be downloaded. But what if we want to update our dependencies to the latest versions? 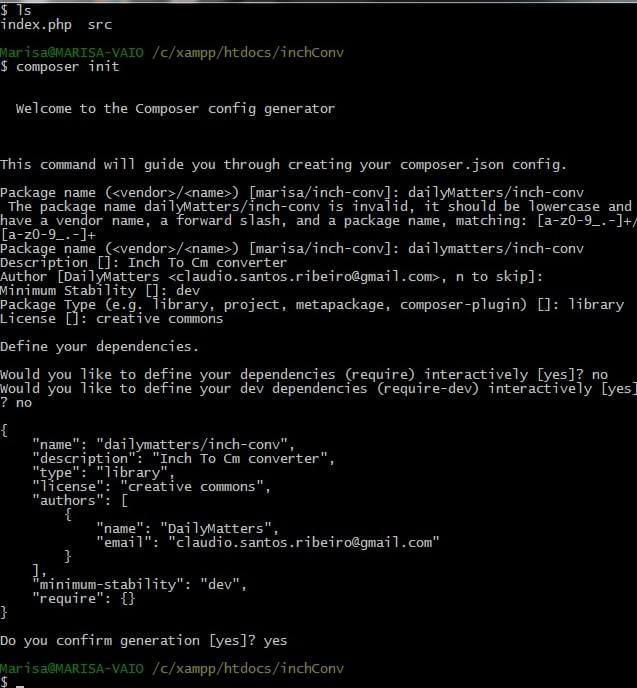 To update dependencies, Composer provides the composer update command. This command will not only download the latest versions of our dependencies, it will also update the composer.lock file to the new versions. Running composer update is actually the same as deleting composer.lock and then re-running composer install. It is generally recommended to commit the composer.lock file into the version control system when working on a project (app) and to ignore it when working on a package. A package should always strive to use the latest version of its dependencies, while an app is generally more fragile. More discussion about this and alternative approaches here. The autoloading provided by Composer to access the project’s dependencies is very useful, and can also be used to access our own application’s code. To do this, we need to register our code in the composer.json file using the autoload key. First, Composer will register a PSR-4 autoloader for the Foo namespace. Then, we map the Foo namespace to the /src folder. The /src folder should be at the same level as the /vendor folder (root of the project). After this, we need to re-generate the vendor/autoload.php file. Composer provides a command for this: composer dump-autoload. Pro-tip: composer du would also work, because composer runs any command which is uniquely identified by its first few letters. In dump-autoload‘s case, there’s no other command in the Composer namespace that starts with du, so Composer knows that’s the one we want. This works with all Composer commands. This way we are adding our own code to the autoloader. In addition to PSR-4 autoloading, Composer also supports PSR-0, classmap, and files autoloading. Check out the documentation for more information on autoloading with Composer. Sometimes, your project will depend on packages that don’t have a stable version released. Composer defaults to preventing unstable packages from being installed. In those cases, it’s easy to add the minimum-stability flag into the composer.json file, and Composer will allow their installation. Almost all configuration values can be edited from the command line, as explained in this section of the docs. Some packages can come in handy if installed globally. Case in point, tools like Spress and Laravel can have command line tools for generating new projects, re-running some common commands, etc. Likewise, a test suite like PHPUnit can benefit from being runnable from any part of the system, and makes the project it’s testing much lighter. However, according to some, this is considered harmful. Your mileage may vary – we’ve generally found that when a professional and modern approach of developing in an isolated environment is followed, global require is 100% safe to use. Packagist is Composer’s main repository. This is where all the Composer packages are aggregated, which means that when we execute composer search <package> we are actually searching Packagist. The Packagist website also has information on all the packages and a useful search and sort engine. This way, PHP developers don’t have to spend days searching for packages on Github. Not only does Packagist aggregate PHP packages, it also encourages PHP developers to submit their own packages, strengthening the community. As you can see, a very simple class. The second step is to navigate to the root of our project and run the composer init command to run the wizard and generate the composer.json file. Let’s now run composer install so that our autoloader can be created. Then, let’s test our package. In the root of our project, let’s create an index.php file. As you can see, we are using the require_once '/vendor/autoload.php'; line to autoload our class and then using it to do some conversions. Testing it on the command line with php index.php should produce the desired result. To submit this package to Packagist, we need to push it to a Github repo. Then, we sign in to Packagist using our Github account, hit Submit, and point to our newly created Github repo. Remember to update Packagist whenever you update your repo in Github! You can either configure Packagist to do it automatically, or you can access your package on Packagist and click the Update button. This way, your package in Packagist will always mirror your package’s Github state. Composer has revolutionized the way PHP developers work, and promises to continue doing so. It’s a powerful and essential tool for any PHP developer’s tool belt, and the cornerstone of many modern PHP applications. Are you using Composer? Is anything about it unclear? Let us know in the comments below.